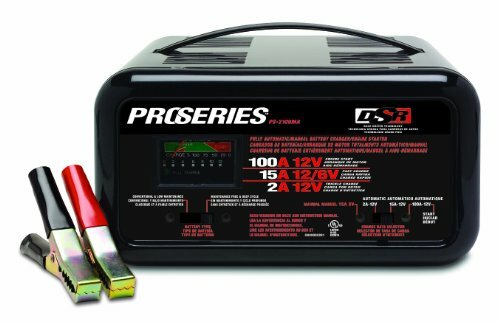 Schumacher’s PS-2100MA Automatic/Manual ProSeries Bench Battery Charger with Engine Start charges 6 and 12 Volt batteries, with 3 different ampere ages. The 100 ampere 12 Volt engine start is for emergency starting, the 15 ampere fast charge will charge 6 or 12 Volt batteries in 2-5 hours. The 2 ampere trickle charge will charge small 12 Volt batteries in 2-12 hours. This Battery Charger/Starter is equipped with 2 LED displays, to signal Power On and Fully Charged.